Please read these Terms of Service ("Terms", "Terms of Service") carefully before using Biosec's pre-enrolment application (the Service), hosted on the Biosec Solutions website ("us", "we", or "our"). By accessing and using this website, the user (you) accept and agree to be bound by the terms and provision of this agreement. In addition, when using this website’s Service, you shall be subject to any posted guidelines or rules applicable to such Service, which may be posted and modified from time to time. All such guidelines or rules are hereby incorporated by reference into the Terms of Service. Any information that you provide during the use of our Service will be considered as accurate by the Service. You will be held liable for any invalid information provided during your use of this Service and will bear all responsibility (including correction or legal fees) that will facilitate a change of information after your pre-enrolment process (Process) has been completed. The Process shall be considered completed once the enrolment process commences at any enrolment centre. We work hard to provide the best Service we can and to specify clear guidelines for everyone who uses them. Our Service, however, is provided "as is", and we make no guarantees that it will always be safe, secure or error-free, or that it will function without disruptions, delays or imperfections. To the extent permitted by law, we also DISCLAIM ALL WARRANTIES, WHETHER EXPRESS OR IMPLIED, INCLUDING THE IMPLIED WARRANTIES OF MERCHANTABILITY, FITNESS FOR A PARTICULAR PURPOSE, TITLE AND NON-INFRINGEMENT. We do not control or direct what people and others do or say, and we are not responsible for their actions or conduct (whether online or offline) or any content that they share (including offensive, inappropriate, obscene, unlawful and other objectionable content). We cannot predict when issues may arise with our Service. Accordingly, our liability shall be limited to the fullest extent permitted by applicable law, and under no circumstances will we be liable to you for any lost profits, revenues, information or data, or consequential, special, indirect, exemplary, punitive or incidental damages arising out of or related to these Terms, even if we have been advised of the possibility of such damages. You are responsible for all activities that occur under your Service Account, regardless of whether the activities are undertaken by you or a third party (including your contractors or agents). Except to the extent caused by our breach of these Terms, we and our affiliates are not responsible for unauthorized access to your Service Account. You are solely responsible for maintaining the security of your password. You may not disclose your password to any third party (other than third parties authorized by you to use your Service account) and are solely responsible for any use or action taken under your password. You will contact us immediately if you believe an unauthorized third party may be using your Service account or if your Service Account information is lost or stolen. You are responsible for ensuring that all users affiliated with your Service Account are aware of and comply with these Terms. The Service permits online payment of necessary fees using PayPal and any other third party online payment services that support online payments. You will be liable to the payment information you provide to these online payment services and we will not be held accountable for any invalid information provided nor will we be held responsible for the initialization, implementation, progression, nor completion of any possible refund process that arises during your use of our Service. We do not save any credit card information that you provide during your use of our service. Any issue regarding credit card information will not be held as our liability. The Service permits you to authorise a payment agent (Agent) to handle a portion or the entirety of your online and/or offline payments. All dealings with the Agent will be at your discretion and will be believed to be done with your acquired consent. You will be held liable for the credibility of this agent as well as possess full responsibility for the Agent's actions, including but not limited to all payment transactions either directly or indirectly related to our Service. We will not bear any responsibility, partial or entirely, in the facilitation, processing, observation, or the completion of any refund activities needed or wanted at your discretion. All payment discrepancies generated during your use of our Service via the use of an Agent will be your sole responsibility. We shall not be held liable for the Nigerian national identity card delivery service. All responsibility regarding card production and delivery will fall upon the National Identity Management Commission (NIMC) and all issues regarding these processes will be resolved at NIMC’s sole discretion. Our Service may provide behavioural ads provided by third party ad providers such as Google's AdSense and other possible ad servers. These ads may be provided through the use of third-party tracking cookies or associated online behavioural trackers that will provide online ads tailored according to your online activity. The Service contains many valuable trademarks owned and used by Biosec Solutions, its affiliates, and related entities throughout the world. These trademarks are used to distinguish Biosec Solutions' quality products and services. These trademarks and related proprietary property are protected from reproduction and simulation under national and international laws and are not to be copied without the prior express written permission of Biosec Solutions. The text, graphics and source code contained in the service are the exclusive property of Biosec Solutions, its affiliates or related entities. Except where otherwise noted, the text, graphics and source code contained here may not be copied, distributed, displayed, reproduced or transmitted in any form or by any means without the prior express written permission of Biosec Solutions. The Service may link to sites or other applications not maintained by or related to Biosec Solutions. External links are provided as a service to users and are not sponsored by or affiliated with this Service or Biosec Solutions. Biosec Solutions has not reviewed the sites or applications linked to or from this Service and is not responsible for the content of any other site or application. These links are to be accessed at the user's own risk. 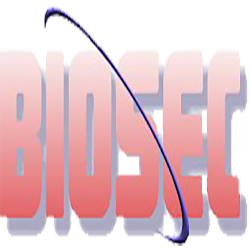 Biosec Solutions makes no representations or warranties about the content, completeness, or accuracy of these links or the sites or applications linked to this Service. Furthermore, Biosec Solutions does not implicitly endorse third-party sites or applications linked to this Service. The content on the Service, including, without limitation, the text, software, scripts, graphics, photos, images, concepts, sounds, music, videos, interactive features and the like ("Content") and the trademarks, service marks and logos contained therein ("Marks"), are owned by or licensed to Biosec Solutions, subject to copyright and other intellectual property rights under Nigerian laws (as applicable) and international conventions. Content on the Service is provided to you as is for your information and personal use only and may not be used, copied, reproduced, distributed, transmitted, broadcast, displayed, sold, licensed, or otherwise exploited for any other purposes whatsoever without the prior written consent of the respective owners. Biosec Solutions reserves all rights not expressly granted in and to the Service and the Content. You agree not to engage in the use, copying, or distribution of any of the Content other than expressly permitted herein for any commercial purposes. If you download or print a copy of the Content for personal use, you must retain all copyright and other proprietary notices contained therein. You agree not to circumvent, disable or otherwise interfere with security related features of the Service or features that prevent or restrict use or copying of any Content or enforce limitations on use of the Service or the Content therein. You affirm that you are 16 years and above, or possess legal parental or guardian consent, and are fully able and competent to enter the terms, conditions, obligations, affirmations, representations, and warranties set forth in these Terms & Conditions of Use, and to abide by and comply with these Terms & Conditions of Use. We may in our discretion change these Terms, Biosec Solutions' Conditions of Use and Privacy Notice, or any aspect of Biosec Solutions or any of its affiliated services, without notice to you. If a revision is material we will try to provide at least 30 days' notice prior to any new terms taking effect. What constitutes a material change will be determined at our sole discretion. If any change to these Terms is found invalid, void, or for any reason unenforceable, that change is severable and does not affect the validity and enforceability of any remaining changes or conditions. USE OF THE PRE_ENROLMENT SERVICE AFTER WE CHANGE THESE TERMS CONSTITUTES YOUR ACCEPTANCE OF THE CHANGES. IF YOU DO NOT AGREE TO ANY CHANGES, YOU MUST IMMEDIATELY END YOUR USAGE OF THE SERVICE. If you have any questions about or suggestions for these Terms, please contact us at info@biosec.com.ng.